Can Schools Change Measures of Success by Focusing on Meaningful Work Instead of Test Scores? 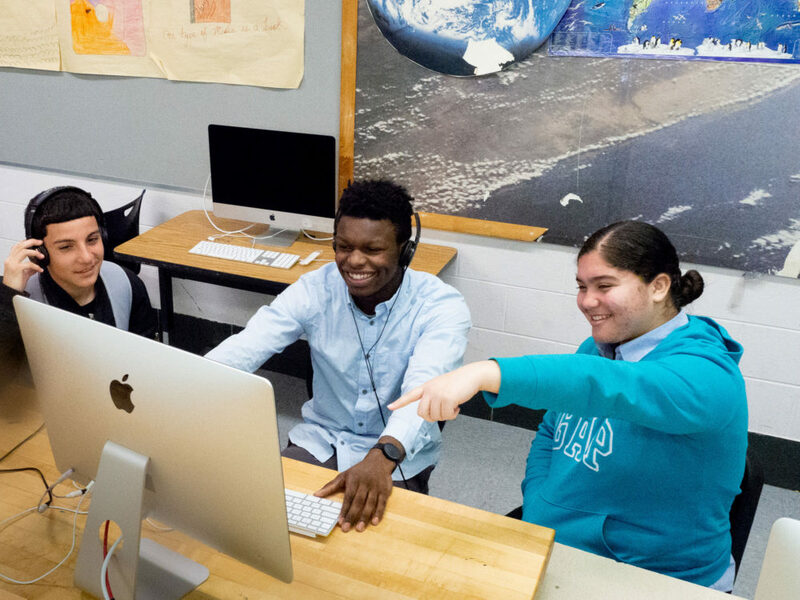 This story about project-based learning was produced by The Hechinger Report, a nonprofit, independent news organization focused on inequality and innovation in education. Sign up for the Hechinger newsletter. PHILADELPHIA — In a city that’s struggled to meet the educational needs of many of its children, especially its most vulnerable ones, a select group of district high schools is shunning the traditional classroom model in which teachers dispense knowledge from the front of the room and measure progress with tests. Instead, the schools have adopted an approach that’s become increasingly popular among education advocates and funders: project-based learning. In this model, students embark on in-depth investigations relevant to their lives and their communities. Projects are organized around the development of skills like student collaboration, problem-solving and self-reflection through assignments that blend research with public presentations. They’re precisely the skills that colleges and employers say graduates need for success. Yet, in a school district where more than half of 8-year-olds are reading below grade level and a third of high school students don’t graduate, there’s an urgency to demonstrate improved results. One of the challenges facing a project-based learning (PBL) model lies in measuring the very benefits that characterize it. “We haven’t figured out how to assess the outcomes of PBL and that is a huge issue,” said Maia Bloomfield Cucchiara, associate professor at Temple University. That’s a potential liability in a city looking to change the narrative of an urban school system that persistently lags behind statewide averages in academic proficiency. Philadelphia’s move toward the project-based model is part of a broader push to open alternatives to neighborhood comprehensive schools, which have struggled in the face of chronic underfunding. 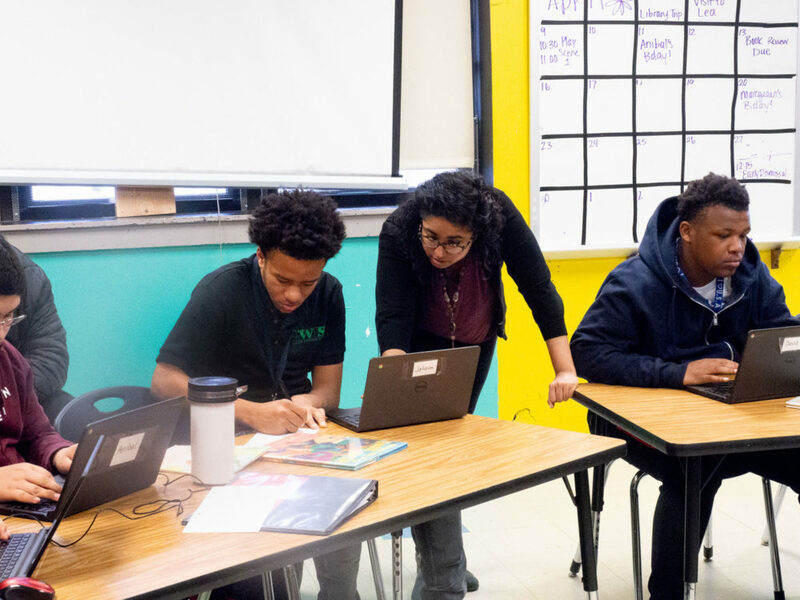 Project-based learning advocates are confident that the model can succeed in Philadelphia by providing students with skills that translate equally to both postsecondary and career options. Less certain, however, is whether its adoption can push educators, students and families to re-examine assumptions about the very purpose of high school. Is the goal to improve test scores or prepare students for adulthood? At the city’s project-based schools, the student experience is markedly different from that in more traditional high schools. The message of teamwork and accountability, all in the service of a tangible product is, by now, a familiar one for this inaugural class of students at Vaux, the newest addition to Philadelphia’s network of recently opened small high schools designed around the project-based learning curriculum. The visit to Bar Hygge is part of a required course in which freshmen spend one afternoon each week visiting a different business or community organization in order to identify internship opportunities they’d like to pursue in their sophomore year. One of the barriers to measuring the effectiveness of the model is that there’s no universal standard for what constitutes a project-based learning curriculum. At Vaux, the model is designed around the internship program. Some schools have adopted a more career and technical education approach while others focus on projects tied to community needs. Education advocates say that, looking beyond test scores, a more accurate measure of success for Workshop, or any other high school, should involve following kids in the years after graduation. Are they engaged in a postsecondary experience that’s meaningful, like working at a living wage job with upward mobility or attending a college or technical school? Fostering that kind of success isn’t easy. It demands unwavering commitment from teachers and stable leadership through the inevitable challenges. North Philadelphia’s The LINC High School, set in an area with one of the city’s highest violent crime rates, has faced several obstacles in its short history. Designed around a project-based learning curriculum when it opened in 2014, the school’s founding principal announced she was leaving for a job in Baltimore just days into the first school year, a move that led to an exodus of some faculty and students and a retreat to more traditional methods. Current principal Bridget Bujak says that following the upheaval of having three principals in a single year, the school did not begin to reintroduce the schoolwide project-based learning curriculum until 2017. “Everyone really struggled with the model,” she said, noting that as a nonselective school, she has some ninth-graders coming in at a kindergarten reading level. While the program is less hands-on than Workshop’s, student work remains focused on the surrounding community. Recent projects involved creating designs for residential construction and analysis of neighborhood crime patterns. 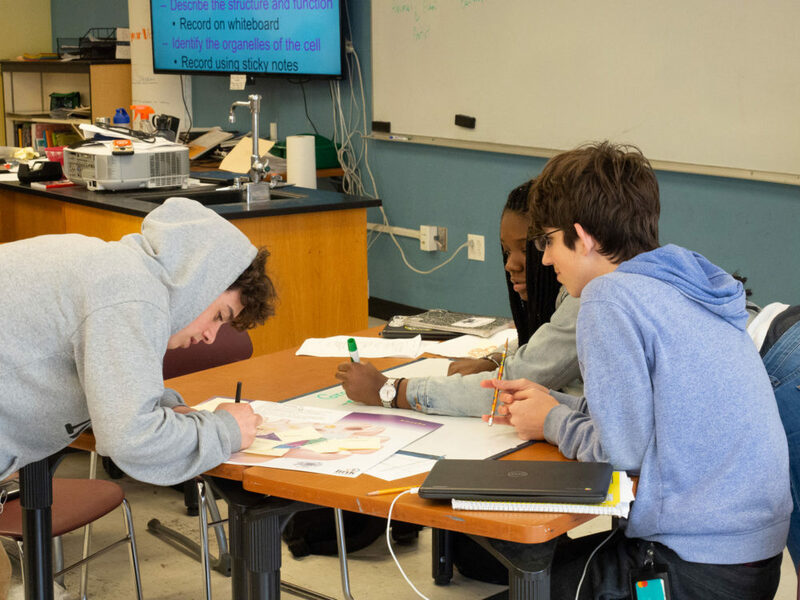 Project-based learning’s student-focused approach, which values the process of learning for each child rather than simply recording test grades, forces everyone in the building to work more closely together, Philadelphia educators in the project-based learning schools say. The result has been strengthened relationships between students and teachers, helping schools be more attentive to their students’ needs beyond academics. Building meaningful, caring relationships like these is crucial to success, teachers and principals say, but is not something you’re rewarded for on a proficiency test. Philadelphia assistant superintendent Christina Grant, who oversees the district’s network of project-based learning high schools, stresses that while project-based learning schools may put an emphasis on difficult-to-measure metrics, they will be held to the same level of accountability as other district schools. “None of the things we measure have shifted,” she said. If the project-based learning schools show measurable gains in test scores or graduation rates, she said, the district will look to them for methods that can be expanded to primary schools. An unqualified success for these new schools would be results like those at Science Leadership Academy, a magnet school that is home to the district’s longest-running project-based learning program, which opened in 2006. The school combines rigorous research with student-driven projects that have impact beyond the school building. One student project involved putting on a city-wide Ultimate Frisbee tournament. In the 2016-17 school year, 99 percent of its seniors graduated, and 84 percent attended college immediately afterward. Algebra, Biology and English literature proficiency scores at the school are more than double the district high school average. It may prove difficult for other schools to replicate Science Leadership Academy’s performance, however. As a magnet school, it has selective admissions and attracts students from a wider range of socioeconomic backgrounds (fewer than half its students receive free or reduced-price lunch, for example) than the city’s other project-based learning schools. Lehmann acknowledges the inherent advantages at a school that’s able to choose its students — applicants must meet minimum grade requirements and sit for an interview — but, like his counterparts at Philadelphia’s nonselective project-based learning schools, he argues that we need to be taking a more holistic view of school performance. “How you judge a school is an incredibly nuanced thing,” he said. “The way that we take care of each other and the way that we learn are intertwined.” There may not be a quantitative metric to assess whether students are being provided with meaningful work in an environment that lets them know they are cared for, but Lehmann believes that without those components, grades and test scores become an end unto themselves. Tamir Harper is an 18-year-old senior at Science Leadership Academy whose passion is education reform: In 2017 he founded a nonprofit that advocates for quality urban education. He says that when he arrived at the school he was obsessed with grades. 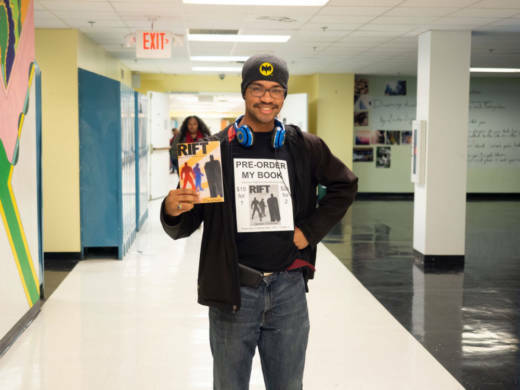 “I just wanted to know ‘How can I get an A?’ I didn’t care if I was learning, or comprehending,” he said. “Now I’m a student that wants to learn, and I don’t worry about the end result [grade]. I’m into the process.” He says a big part of that shift was the relationships he forged at school. “We’re not just project-based, we’re a community-driven school,” he said. That sentiment was a common refrain at Vaux, LINC and Workshop, each of which offer slightly different approaches to project-based learning in underserved communities. Educators at each are confident that the skills their students are acquiring — collaboration, critical thinking and problem-solving — will eventually manifest themselves in improved results on more traditional metrics like math and reading tests. More importantly, however, they believe that students will be much more prepared for the real world when they leave school. Whether project-based learning done on a larger scale can turn the tide in Philadelphia is another question.